Preetesh D. Patel, MD, from Cleveland Clinic Florida, Weston, Florida, has been performing total hip arthroplasty (THA) through the direct anterior approach for the last 5 years. 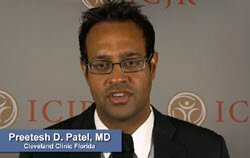 In an interview with ICJR, Dr. Patel discusses his use of the C-arm. Click the images below to hear his comments. Next articleRethinking Surgical Repair of SLAP Lesions?